The first part of this series appeared in the winter 1994 issue, and highlighted Lavediere's Garage in Lake Linden, Michigan. This time we move down the range to a point three miles south of Houghton in the tiny hamlet of Atlantic Mine. Today Atlantic Mine is only a shadow of its former self -- production peaked in 1903 at 7,670,660 pounds of mineral produced. The mine closed in 1906 due to repeated cave-ins caused by failure to reinforce the mine in its early stages. The Atlantic was touted as the "finest low-grade mine to be found anywhere". If it were not for the 1906 calamity the Atlantic may have well been compared to the wealthiest copper mine of the region, the Calumet and Hecla. The property was eventually purchased by the giant South Range copper producer, the Copper Range Consolidated Company. Only minor activity occurred in this area after the 1910's. When I first came across a picture of this structure I was immediately taken by its appearance. In a land filled with copper mines it is unusual to find an on-line structure that has nothing to do with mining. 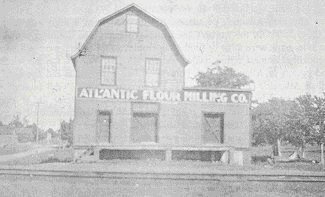 The Atlantic Flour Milling Company was a community venture. The mill ran 24 hours a day during harvest time, and gathered grain from all over the Portage Lake district, according to a long time local resident. 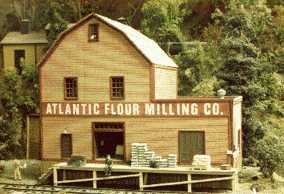 The flour mill opened in 1919. During a recent trip to the region I found another photo of this structure which showed that the mill was located adjacent to the Atlantic Mine Depot. I have determined the exact location of every Copper Range Railroad station with the use of many old CRRR timetables and current Topographic maps (7.5 minute series). The foundation of this structure can still be found right off the CRRR main line in Atlantic Mine. On the cornerstone of the foundation I discovered the following inscription: A.F.M.C. 1919. The size of the trees growing in the foundation indicates that the "closed" sign has been out for at least 50 years. I enjoy being able to find an old photograph and trace the exact location of the structure. In the Keweenaw region only about 20 percent of the structures built between 50 and 150 years ago are still standing. The region was generally Paternalistic (company owned), which meant that companies bought and sold whole towns and what wasn't sold was allowed to decay over time.Often remains of original structures can be found (usually foundations), if you know where to look. At the site of the AFMC. I measured the dimensions of the foundation. I should note that I produced my model before I discovered this site and the actual dimensions of the structure are as follows: 34 feet across the front by 37 feet front to back. The barn portion is 24 feet wide in front. I did not have a photo showing a side view so I made the width of my model 26 feet. The proportions of the plan fit very closely to the actual dimensions. In general, finding any structural remains can be of great importance in the development of prototype plans. I used this same method to find the CRRR water tank at Mill Mine Junction. I have a couple of photos and I used these photos and my maps to determine the exact location. At Mill Mine Junction I found, in the brush, the pedestals for the tank, and therefore I was able to determine the dimensions on the photos. Just because a structure is no longer extant doesn't mean you can't measure it (Just bring a lot of black fly repellent). Although not exactly an architectural marvel, this structure is a good example of Dutch Colonial design, especially with the flared eaves. The original structure appears to have more closely resembled a barn than mine, but my plans are reduced in width to fit on my railroad. The add-on "box" section on the right is not Dutch Colonial and is an additional mystery to me. I have for years wondered why anyone in the Keweenaw would build a structure with a flat roof. I lived in Houghton during the winter and have shoveled 400-plus inches of snow off of a flat roof. Many structures in this region have flat roofs and I have seen many of these collapse due to the weight of snow upon them. Structures of this type would have been constructed using the "post-and-girt" method, which employs the use of heavy timbers and hewn joints (8x8's) to completely form the support structure. The outer shell is covered in 1x6 lap siding and painted with a wash of box car red and thinner. The interior includes a second floor mill, where grain is raised by hoist to the mill, then ground and dropped by gravity to awaiting bags, kegs, etc. for final shipment. at the platform, which is washed and weathered bare wood. The windows and doors on the model are Grandt Line. The two large doors are both the same Grandt Line door, one with the upper window removed. All the windows selected fit very close to the prototype. The lettering was completed by first painting the background Antique White, letting it dry, and then placing the dry transfer lettering on top of the white background. The whole sign was then lightly sprayed with red and left to dry overnight. After the paint has completely dried the lettering is lifted off with tape to reveal the white lettering. In this manner any color sign is simple to make with black dry transfer lettering. This model is finally finding a home again in Atlantic Mine on my railroad. As I have recently been able to operate my railroad for the first time I have gained the added advantage of knowing a little more about the buildings on my railroad. When I move a car to and from this industry I have the added pleasure of knowing that another shift of hungry miners will have flour for their pasties when they go underground tomorrow.